Q. How do I find Library databases with a specific type of material or content? You can use the filters on the Databases A-Z page to see databases that have a certain type of material or content, such as videos, encyclopedias, or newspapers. Keep in mind that many databases have more than one type of content and will be included in different filtered lists. 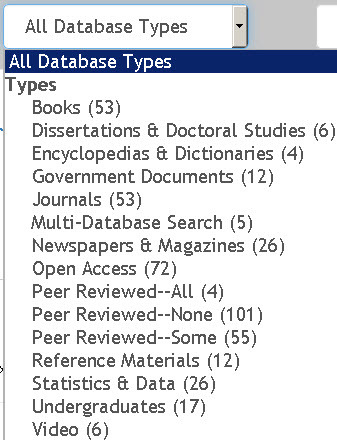 On the Library homepage, click on Databases A-Z in the center. Click on the content type you want.